We visited Vienna, Austria for the entire month of December, just because we’d heard that the Christmas markets were so good – and they were! It was a bit cold for our taste, though I suppose that’s to be expected. Vienna was the last stop of our year of slow travel in Europe (but not the end of our journey). We chose to spend December in Vienna, Austria because the city is famous for its Christmas festivities. That reputation is well deserved – they really decked the halls – but while there was a lot for the two of us to enjoy as grown ups, we often feared that our two-year-old daughter wasn’t having as much fun as we were. 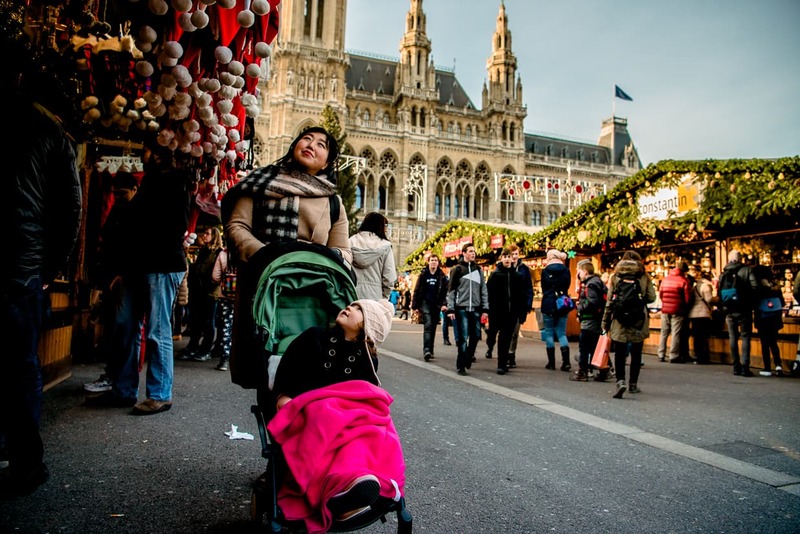 In this article we discuss some of the cultural and geographical reasons why Christmas in Vienna is more magical for adults than children. We really wanted to eat a meal (and take some photos) in Vienna’s iconic Cafe Central. We walked by it a few times to admire its architecture and decor, but we were turned off by the long line to get in. When there’s a will there’s a way. We visited the morning after Christmas and had the place to ourselves for long enough to snap some photos and enjoy a relaxing meal (of course, relaxing is a relative term when you are traveling with a toddler. Every winter Vienna hosts a months long festival of sorts, the center of which is a giant ice skating rink. Baby Lisa had been desperate to try ice skating ever since she saw it in her cartoons, so we made a point of giving it a shot. In this post, we discuss what the ice skating experience is like at Wiener Eistraum, and what else there is for children and adults to enjoy. This was probably the highlight of our December in Vienna.